BETTER PRODUCTION MMS JUNE 2018 128 mmsonline.com SHOP MANAGEMENT management's support, it will probably be apt to have manufacturing focus; operational flexibility; a culture of continuous improvement through teamwork; performance metrics that do not pro- mote individualistic or elitist behavior; and a sense of ownership and autonomy for its members. 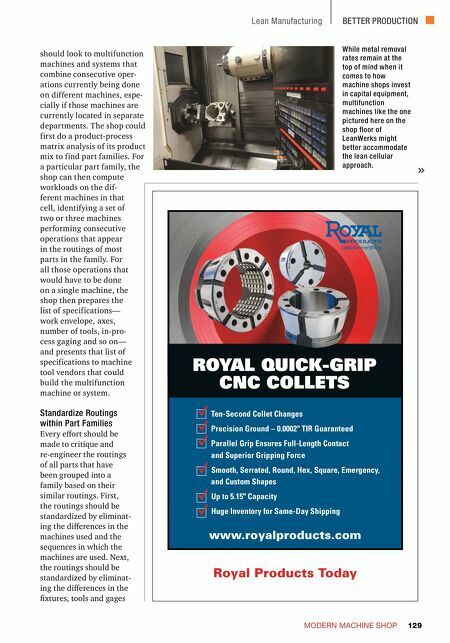 Right-Size Non-Machining Processes CNC machine tools alone do not determine a machine shop's delivery performance and prof- itability. Manual processes such as sawing and inspection, and non-machining processes such as heat treatment, electroplating, coating and wash- ing are often root causes for long delivery times. Right-sizing a process that is currently external to a cell, such as washing, painting, deburring or inspection, can allow it to be brought into the cell. This can have a significant impact on quality, delivery time and work in process. This shift also can improve morale and job satisfaction for the cell personnel because the team's performance will not be affected by the workmanship and schedule priorities of others, including those who work in both other cells and external depart- ments that serve all cells. There are limitations to this idea. Processes like heat treatment or electro-plating could hardly ever be colocated with CNC machines. Inspection is often the real bottleneck, but this problem is not necessar- ily easy to address. When will the day come when inspection in a shop can be right-sized and the inspection department eliminated? Purchase a Multifunction Machine Tool Metal removal rates generally remain the chief driver of a machine shop's capital invest- ment choices. Unfortu- nately, the mindset of "keep making chips" can result in the purchase of machines that 1) do not alleviate the shop's capac- ity constraints, 2) do not increase throughput at bottlenecks, 3) waste payroll to keep employees busy producing WIP, and 4) do not reduce the total distance that the typical order must travel through the shop. 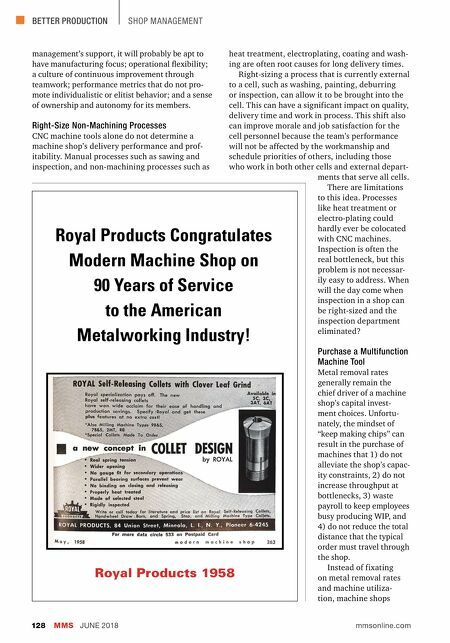 Instead of fixating on metal removal rates and machine utiliza- tion, machine shops Royal Products 1958 Royal Products Congratulates Modern Machine Shop on 90 Years of Service to the American Metalworking Industry!